GALLUP — Local peace activist Marcus Page will be showing a new, extended version of his film "A Peace of the Anarchy" this week in Gallup. Page's first version of the documentary was shown at the theater in August and September. The new, extended version has about eight additional minutes of footage. 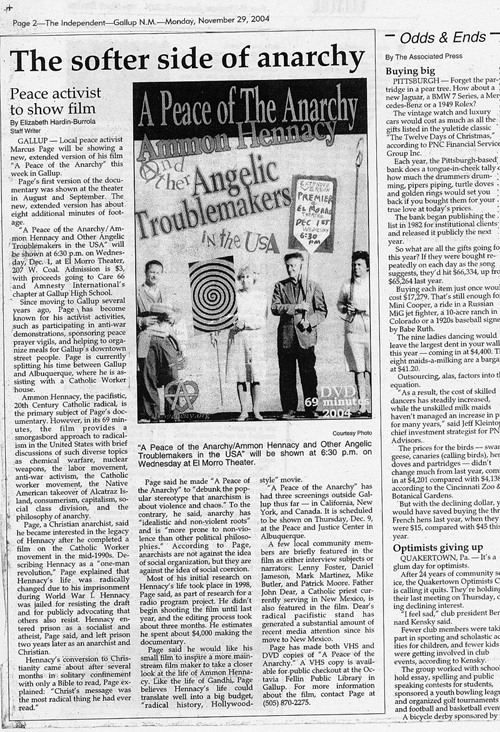 A Peace of the Anarchy/Ammon Hennacy and Other Angelic Troublemakers in the USA will be shown at 6:30 p.m. on Wednesday, Dec. 1, at El Morro Theater, 207 W. Coal. Admission is $3, with proceeds going to Care 66 and Amnesty International's chapter at Gallup High School. 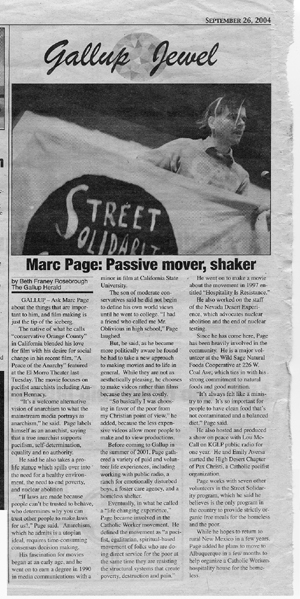 Since moving to Gallup several years ago, Page has become known for his activist activities, such as participating in anti-war demonstrations, sponsoring peace prayer vigils, and helping to organize meals for Gallup's downtown street people. Page is currently splitting his time between Gallup and Albuquerque, where he is assisting with a Catholic Worker house. 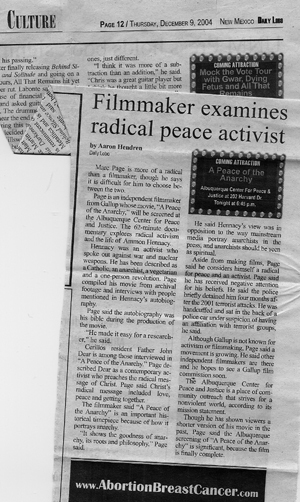 Ammon Hennacy, the pacifistic, 20th Century Catholic radical, is the primary subject of Page's documentary. However, in its 69 minutes, the film provides a smorgasbord approach to radicalism in the United States with brief discussions of such diverse topics as chemical warfare, nuclear weapons, the labor movement, anti-war activism, the Catholic worker movement, the Native American takeover of Alcatraz Island, consumerism, capitalism, social class division, and the philosophy of anarchy. Page, a Christian anarchist, said he became interested in the legacy of Hennacy after he completed a film on the Catholic Worker movement in the mid-1990s. Describing Hennacy as a "one-man revolution," Page explained that Hennacy's life was radically changed due to his imprisonment during World War I. Hennacy was jailed for resisting the draft and for publicly advocating that others also resist. Hennacy entered prison as a socialist and atheist, Page said, and left prison two years later as an anarchist and Christian. Hennacy's conversion to Christianity came about after several months in solitary confinement with only a Bible to read, Page explained: "Christ's message was the most radical thing he had ever read." Page said he made "A Peace of the Anarchy" to "debunk the popular stereotype that anarchism is about violence and chaos." To the contrary, he said, anarchy has "idealistic and non-violent roots" and is "more prone to non-violence than other political philosophies." According to Page, anarchists are not against the idea of social organization, but they are against the idea of social coercion. Most of his initial research on Hennacy's life took place in 1998, Page said, as part of research for a radio program project. He didn't begin shooting the film until last year, and the editing process took about three months. He estimates he spent about $4,000 making the documentary. Page said he would like his small film to inspire a more mainstream film maker to take a closer look at the life of Ammon Hennacy. Like the life of Gandhi, Page believes Hennacy's life could translate well into a big budget, "radical history, Hollywood-style" movie. "A Peace of the Anarchy" has had three screenings outside Gallup thus far in California, New York, and Canada. It is scheduled to be shown on Thursday, Dec. 9, at the Peace and Justice Center in Albuquerque. A few local community members are briefly featured in the film as either interview subjects or narrators: Lenny Foster, Daniel Jameson, Marc Martinez, Mike Butler, and Patrick Moore. Father John Dear, a Catholic priest currently serving in New Mexico, is also featured in the film. Dear's radical pacifistic stand has generated a substantial amount of recent media attention since his move to New Mexico. Page has made both VHS and DVD copies of "A Peace of the Anarchy." A VHS copy is available for public checkout at the Octavia Fellin Public Library in Gallup. For more information about the film, contact Page at (505) 870-2275.